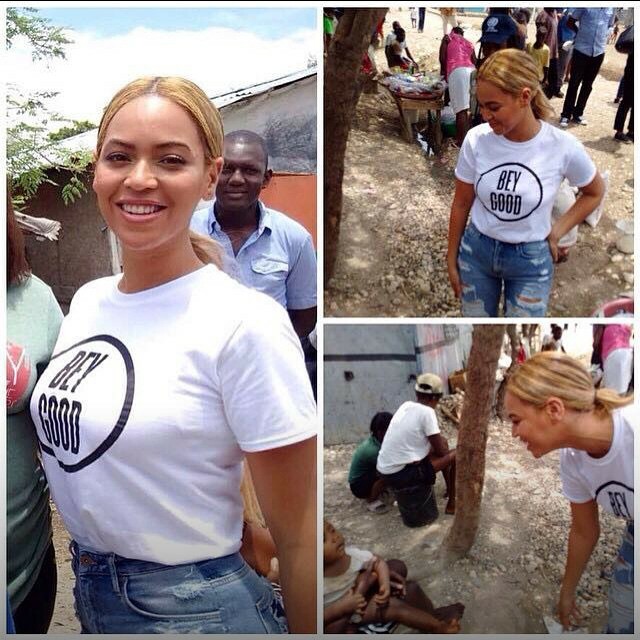 Beyonce took a break from flaunting her street style in the big apple to making a surprise visit to Haiti today. According to VIBE, Beyonce is aiding the United Nations in a humanitarian mission. Likely a well-deserved one given that the impoverished Caribbean country is still rallying from that massive 7.0 earthquake in 2010.
more than half a million don’t have a steady supply of food and 172,000 are still living in temporary displacement camps set up five years ago. But not to fear, Queen Bey is there. Well… for one day, at least. Sporting her BEY GOOD tee (Beyonce’s charity org) she gave out food, water and other much-needed resources. Beyonce even lent a hand to sick natives battling a cholera epidemic. This isnt the first time Beyonce worked with the UN. In 2012, she gave a very soulful presentation at UN headquarters for World Humanitarian Day. See how she blew the roof off the iconic place with her visual version of “I Was Here” below.